Alice Ellen Terry was born in Coventry, England, the third born child in a theatrical family. Her parents, Benjamin and Sarah (née Ballard), were comic actors in a touring company based in Portsmouth and bad eleven children, at least five of whom became actors. Between 1861 and 1862, Terry was engaged by the Royalty Theatre in London and then went on to play a variety of roles and parts, including burlesque roles requiring singing and dancing. In 1863 Terry; now aged 15, appeared at the opening, as Titania, in A Midsummer Night's Dream in Bath and then returned to London to join the company at the Haymarket Theatre in Shakespearean roles. In London, during an engagement at the Haymarket Theatre, Terry and her sister Kate bad their portraits painted by the eminent artist George Frederick Watts, and he was so taken by Terry that he proposed marriage. Watts did many works featuring Terry the most famous of which is Choosing in which Terry must select between earthly vanities, symbolised by showy; but scentless camelias and nobler values symbolised by humble-looking, bur fragrant violets. Terry was impressed with the air and elegance of his lifestyle and wished to please her parents by making an advantageous marriage. The actress and the painter married on 20 February 1864, shortly before Terry's 17th birthday, when Watts was 46. The marriage was not a success with Terry uncomfortable in the role of child bride. Terry and Watts were separated after only ten months of marriage, during which she took a break from the stage, returning by 1866. Terry played opposite many of the great actors ocher day including Henry Irving and Charles Wyndham and was regarded as the leading Shakespearean actress of her time. In 1868, Terry began a relationship with the progressive architect-designer Edward William Godwin, and bad two children with him, but the relationship cooled in 1874 amidst financial difficulties, and Terry returned to her acting career, separating from Goodwin in 1875. 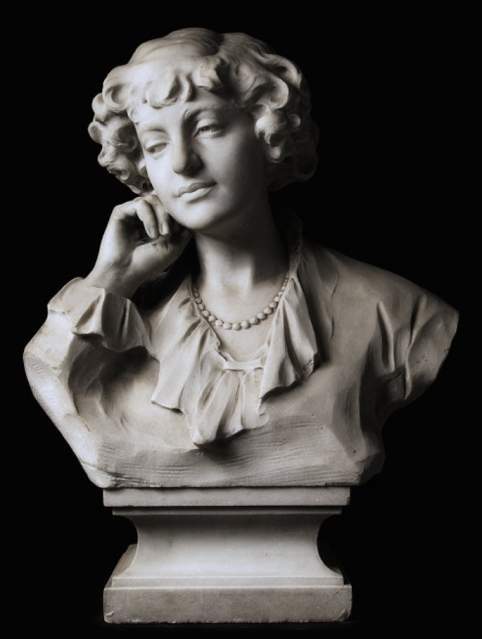 In 1878, the 30-year old Terry joined Henry Irving's company at the Lyceum Theatre as its leading lady, beginning with Ophelia opposite Irving's Hamlet. Soon, Terry Her acting career went on to be increasingly successful with tours of America and ventures into theatre ownership and management. She graduated successfully to film and continued her career after the war both on stage and screen. Bowman, Robert. Sir Alfred Gilbert and the New Sculpture. London: The Fine Art Society, 2008. Pp. 120-21. Dorment, Richard. Alfred Gilbert. New Haven and London: 1985. Pp. 128-30.